For the eighteenth century Episcopal Church, the established Church of England, Long Island, along with the other northern colonies, was a very thorny place. New England had been settled by a variety of dissenters, puritans and separatists who left England to establish their own godly society. Influenced by the continental reformers Calvin and Zwingli, these groups saw the established church as remaining too close to its medieval roots, and insufficiently reformed. Moreover, bishops, in addition to whatever pastoral offices they might have performed, were officials of the government, and New England Protestants feared their influence. The ministrations of the official body were not welcome. People of like mind settled Long Island during the first two thirds of the seventeenth century. Much of the western sections, comprising Kings and much of Queens Counties (which then included present day Nassau) were occupied by immigrants from Holland. The rest of the western end, and all of the eastern part, including eastern Queens and all of Suffolk Counties, were settled by folks of English stock who were most frequently relocated from Connecticut or Massachusetts. Regardless of national origin, these were sturdy yeoman farmers, with some middle class tradesmen mixed in. "Dutch Reformed" or "Presbyterian" in their churchmanship, they shared a similar religious outlook. And so it was in Huntington. The town, established on the north shore of the island, at the western end of Suffolk County, was founded in 1653 by expatriates from Connecticut, and named after the hometown of the Lord Protector, Oliver Cromwell. It was a well-ordered town, built around the village green in the New England manner. Just a half-mile to the west of the Green the Meeting House stood on the bank of a small creek. From the middle of the eighteenth century church polity was Presbyterian. By the beginning of the eighteenth century, Episcopal Churchmen like Thomas Bray, Commissioner of Maryland, were dismayed by the enfeebled state of the church in those few places in the Northern Colonies where it existed. Returning from a visit to the colonies, Bray, wishing to create a permanent source of supply and support for missionaries in North America, met with the Archbishop of Canterbury and the Bishop of London, and friends from the newly formed Society for the Propagation of Christian Knowledge. Together these men petitioned the King and the first meeting of the Society for the Propagation of the Gospel in Foreign Parts (S.P.G.) was held on June 21, 1701. The society commissioned two missionaries, the Revs. George Keith and Patrick Gordon to begin work in the colonies. At the end of 1704 the Rev. 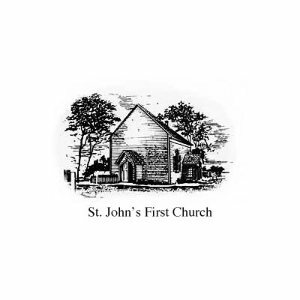 John Thomas became rector of the new St. George's Church in Hempstead, which soon became a center for S.P.G. activity on Long Island. Realizing the struggles before them, Bray and his associates may well have identified with the Sower of Jesus' parable. By the 1740's, The Rev. Samuel Seabury Sr. was rector of St. George's. In 1744 he paid a visit to Huntington, where he found a small group of interested persons. On June 21 of that year Seabury baptized Mary Bryan, the first recorded action in what was soon to be St. John’s. By the following year there was enough interest on the part of the settlers, most notably Henry Lloyd and his associates, to organize a parish. Henry Lloyd had by 1711 acquired ownership of “The Manor of Queen’s Village” (aka Lloyd Neck) from other family members. As Lord of the Manor, he was active in political and social circles and the Church of England. Henry often sailed to church in Connecticut in his sloop Wintworth and wished to build a church in Huntington. Local authorities were opposed, and he settled for having his own pew at the Old First Church, granted on the condition he not invite in another minister to officiate. He soon took offense over the minister, Ebenezer Prime’s sermon on the evils of worldly wealth. About two years later a small church building was erected a little north of the Village Green (located along Park Avenue on the north side of Route 25A). As originally built the main entrance was through a porch on the south wall. Inside, on the north wall opposite the door, there was a two-deck pulpit surmounted by a large sounding board. The chancel, with communion table, was in the East End. The church was fitted with the box pews typical of the period. The picture shows the church as seen from the west, looking towards Park Avenue (across Park Avenue from the present day Huntington Hospital). The door on the West End was a latter addition. In 1748 Samuel Seabury Jr. was appointed Lay Reader and Catechist by the S.P.G., and given charge of the new mission outpost under the direction of his father. Samuel Seabury Jr. was later ordained, and on his father's death in 1764 settled at Grace Church, Jamaica. Until 1766 he occasionally visited and ministered to the Huntington congregation. By 1762 the little congregation had grown to the point where it could acquire a house and Glebe of Sacres of the value of £200 which they would present to the church for the purpose of supporting an ordained minister. Consequently, in 1767 the Rev. James Greaton became the first settled minister at St. John's. He reported that he had “a very decent congregation who almost constantly attend. Frequently a number of dissenters come to hear me, who behave with utmost decency, and seem much pleased. Several times I have had the Church so full that it could not conveniently hold more, and many were obliged to go away for want of room.” Among his congregation he also reported that he had some thirty or forty blacks, slaves or indentured servants. Many came with their masters, while others belonged to dissenters who, nonetheless, permitted them to come to the little Anglican Church. The Rev. Mr. Greaton died in 1773, and was buried beneath the chancel. He was, sadly, the last settled minister for many years. The vacancy could not filled before the Revolutionary War erupted, and during the war, Long Island was a region of divided loyalties. While there were many Tories loyal to the king on Long Island, Huntington was a town of decided patriot sympathies, and no minister associated with the official church dared settle in the area. After the battle of Long Island, the Island was an occupied territory, and except for occasional whaleboat raids from Connecticut, and a brief skirmish in Setauket, there was little fighting. An army of occupation was in residence, and with little to do, the soldiers were bored. St. John's church building was used as a stable and barracks for these soldiers, and was severely damaged. Nevertheless, local families held occasional services, and from time to time a refugee clergyman was available to preach and administer the sacraments. The years after the war were not much better. The Episcopal Church throughout the old colonies had a struggle to reorganize. Seen as a vestige of the King's influence, many parishes were forced to surrender their holdings that provided the income necessary to function. St. John's was no exception. Indeed, while elsewhere the Episcopal Church was able to make a recovery, on Long Island the struggle continued through the first third of the new century. We find, therefore, record of only one baptism during the 55 years from 1783 to 1838. In 1809 the rector of St. Ann's, Brooklyn, visited and found only five communicants. Later the Rev. Charles Seabury was appointed to Setauket, with responsibility for Huntington and Islip. Seabury seems to have visited at intervals between 1814 and 1827. By 1838 the fortunes of the congregation had improved to the point that the parish was incorporated. The Rev. Isaac Sherwood, who had been the rector of St. John’s, Cold Spring, and who had charge of the Huntington congregation as a missionary priest in charge, became the first rector. In the same year, the little church, now ninety-one years old, was finally consecrated by Bishop Onderdonck of New York. Mr. Sherwood remained as rector until 1843, and during his tenure St. John’s became financially independent enough to finally relinquish aid from the Missionary Society. The prosperity seems to have been short lived, and St. John’s still seems to have been like the seed sown among the thorns. At Eastertide in 1848 the congregation refused to proceed with the required parish elections, but rather voted to send a petition to the state legislature requesting the dissolution of the church corporation. No reasons are recorded for the strange resolution, and in any event no action was ever taken upon it. But the fifteen years following the resignation of the Rev. Mr. Sherwood passed with the church under the care of a series of short-term rectors, none lasting more than a year or two. In 1860, during the one-year tenure of the Rev. William Lynd, the vestry agreed to build a new church. At this time the location of the church was perceived as inconvenient for most people to attend, consequently lowering attendance and enfeebling the church. But in spite of these disadvantages, after much debate, it was decided that the new church was to be built on the old site. Later in the year the Rev. Caleb Ellsworth was called. During Ellsworth's tenure the old church was torn down. During the demolition and while excavating for the new foundation, the remains of three bodies were found buried under the church floor. One was certainly that of James Greaton. At first it was assumed that the other two were also clergymen, although there was no record of anyone else having been so interred. Later, it was discovered that one of the skulls was pierced by a bullet hole. The conclusion was that the other two remains had been buried before the church was built; indeed it appears that the church was built on the site of an old cemetery. Bishop Hobart consecrated the new building on May 6, 1862. Among the many dignitaries present were at least two priests who had serve in the parish. The preacher was the Rev. Dr. Seabury, and the Rev. E. K Fowler who had served as a missionary deacon in the 1820’s, also participated. Mrs. Philipse presented the silver communion service that is still used today. By 1867 the diocese of New York had become too large for the ministrations of its bishop, and the chain of events which led to the creation of the diocese of Long Island had begun. 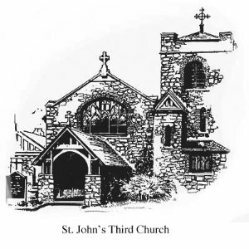 St. John’s had its part in these events, with the vestry resolving on February 3rd that the erection of a new diocese was desirable. The new diocese was formed the following year, with the election of Abram Littlejohn as first bishop, and his see was established at Holy Trinity Church in Brooklyn. St. John’s sent three delegates to the first diocesan convention, one among them being Hiram Paulding Jr., the son of the notable admiral. The remaining years of the nineteenth century found the parish flourishing under a series of rectors. Improvements were made to the church building, and the parish reached out to those living on the geographical fringes by establishing St. Andrew's Chapel in an old corncrib at Huntington Harbor. During the rectorate of the Rev. James Fley Aitkins (1897-1909) misfortune struck. On the Monday after Easter in 1905 a workman, repairing the metal gutters, left a torch burning on the roof. The wooden structure was quickly engulfed in flames, and was soon a total loss. Furnishings, however, were saved, and are used in the current building. In the years from the first settlement of Huntington to the beginning of the twentieth century, the center of the village had been drifting west, so that it was now centered at the intersection of New York Avenue and Main Street, about three quarters of a mile west from the old center around the Green. The change in demographics had been noticed earlier, and had been considered when the decision was made to build the second church. Now that it became necessary to rebuild the church, therefore, the decision was finally made to relocate in the new village center. Miss Cornelia Prime donated the property, and the church was built in English Gothic-style. The first services were held in the new church on Pentecost, 1907. A new parish hall was built, and the church was consecrated in 1917. The 20th century saw rapid growth of the Huntington area. In 1910 the church recognized that members of the congregation in Huntington Station were unable to attend regularly due to the distance to be traveled. Miss Emma Paulding, donated land in the area, and Grace Chapel was established. During the long rectorate of the Rev. Albert E. Greanoff the church experienced its greatest growth. The new Casavant organ was installed in 1928, and other improvements made. By the post World War II period, the Sunday School had grown to such a size that a new building was required. This building was erected during the tenure of the Rev. Canon Kenneth R. Rogers, in 1964. The later years of the twentieth century have seen much change in both the church and the community. The “Baby-Boomers” who filled the Sunday School in Canon Rogers’s time have grown; many have moved on. 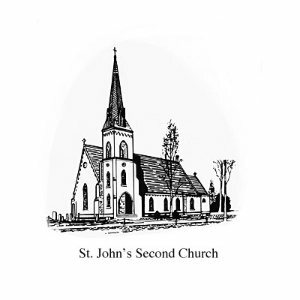 St. John’s experienced a period of “graying” of the congregation. But now, at the beginning of the 21st century, new demographics and new leadership have seen a growth in youth programs, as well as many other programs. An expanded program of cultural events, (musical, educational), helping the needy and the acclaimed Nursery School are very popular in the Community at large. The classroom/office complex built in the 1960s, showing signs of age, proved no longer adequate for St. John’s mission. Consequently, in 2000 the parish embarked on an ambitious program of restoring the historic church, and rebuilding the Christian Education/office wing. The project included a new roof, repairing the masonry walls, repairing the bell tower, building a new sacristy/vestry, kitchen, curate’s apartment, choir room, and classrooms. With these new improvements St. John’s is equipped with the physical resources it needs for another century of service to God and community.